Musicians and music lovers of Western Europe have always been fascinated by this peculiarity of Russian choirs, namely the basso profondo, or in Russian “oktavist”. In 1838, after having heard the choir of the Imperial Chapel of Saint Petersburg, Apolphe Adam pointed out the gripping effect these basses, whose timbre resembles that of an organ, produce on the nervous system of the listener. During his trip to Russia in 1847, Berlioz was full of enthusiasm upon hearing the basses from the same Chapel sing the low A below the bass range. In 1844 Schumann also compared the sonority of Russian basses to the low notes of an organ. An anonymous French traveler during the 17th century that the cantor’s voices in Kremlin churches were so extraordinary and powerful that he thought they must use the iconostasis, the separation covered in icons between the nave ant the alter, as a resonating board! No matter the reason, it’s always difficult to find logical explanations for a passion, and the Russian people truly have a passion for the choir music. 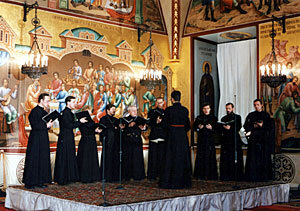 The Orthodox Singers Male Choir was formed in 1992 from the best singers of Moscow churches and monasteries for participation in festive divine services and concerts. The roots of male choral singing in Russia go back to the ancient tradition of the sacristan singers of the sixteenth and seventeenth centuries. The origin of choirs combining service in churches with public performances became possible only when attention was paid to choirs not only as members of the clergy taking part in divine worship, but also as an instrument capable of giving voice to authorial compositions. One of the first choral works belongs to Ivan the Terrible (1530-1584), who was a great admirer of church singing and the founder of one of the first choirs, the State Sacristan Singers. Since its first ever public performance the choir immediately has drawn the attention of listeners and music critics through its high professional skill, restraint, severity of sound reproduction and its special aura of spirituality. At the present time the Orthodox Singers Male Choir is one of the best choirs in Moscow, as testified by its continuing success in concert halls, as well as the great acclaim accorded to it by the Russian and foreign press. The choir actively gives concert performances. Here are but a few of the important concerts given by the choir: the International Festival of Spiritual Music in Moscow, the Archdeacon Konstantin Rozov International Festival of Diaconal Art, the International Spiritual Music Festival in the German city of Marktoberhoff, the Boston International Festival dedicated to the 200th anniversary of the Orthodox Church in America, the World Without Landmines concert in Geneva (under the patronage of Princess Diana). Permanent collaborators with the choir include such renowned masters of vocal art as Peoples’ Artists of the USSR Irina Arkhipova, Artur Eizen, Alexander Vedernikov and others. The choir has collaborated with Irina Arkhipova since 1992, when the choir first began its creative activity. The fruit of this collaboration has been a double CD with the famous singer, joint tours of Russia and abroad and participation in the more important charity events, including the ‘Stars in the Kremlin’ concert and others. 3. Special programs dedicated to the beginnings of church singing: ‘Liturgical Music of the 17th Century’ – manuscripts of monody and early Russian singing for two or three voices deciphered by contemporary musicologists. 4. Chants from the world-famous monasteries: the Monastery of the Caves in Kiev and the Monastery of the Holy Trinity and St. Sergius, the hermitages of Optina and Zossima, the Moscow Kremlin and others. 5. Russian part-singing from the works of Vasily Titov (c. 1650-1710), Baldassare Galuppi (1706-1785), Dmitry Bortnyansky (1751-1825), Artemy Vedel (1767-1808), Stepan Davydov (1777-1825) and others. 6. Works from the Moscow school of composers – Alexander Kastalsky (1856-1926), Alexander Grechaninov (1864-1956), Viktor Kalinnikov (1870-1927), Pavel Chesnokov (1877-1944), Konstantin Shvedov (1886-1954) and others. 7. Works from the St. Petersburg school of composers – Alexander Arkhangelsky (1846-1924). 8. An anthology of church choral works from the seventeenth to the twentieth centuries. 9. Ancient chants in the contemporary tradition of Moscow monasteries. 11. Liturgical music of Orthodox clergy. 12. Works for solo voice accompanied by choir and others. Georgy Smirnov (born 1960) is a professional choirmaster who graduated with honours in 1980 from the Gnesin State Musical College and in 1985 from the Moscow Conservatoire upon completing his thesis on the history of the musical choral cycle of the Orthodox Liturgy. Before the setting up of the Orthodox Singers Male Choir, Smirnov was choir master in churches and of professional choirs in Moscow, including the male choir of the Publishing Department of the Moscow Patriarchate and the choir of the St. Daniel of Moscow Monastery, studied the history of Russian ecclesiastical singing and published a number of collections of Russian church music. As editor of the Muzyka publishing house he produced in 1989 Rachmaninov’s All-Night Vigil. This was one of the first publications of Russian church music after seventy years of neglect. At present, apart from his publishing and concert activities and studio work, he is the director of the choir in the Church of the Nativity of St. John the Forerunner ‘na Presnya’. Sigulda Concert Hall "Baltais Fligelis"